Photo courtesy of Thomas Harnett. Found on luggage in Zhonghsan, China. If you unbewakeable, you are probably dead. If I hear the sound of breaking glass I’ll be awake. Centuwean, bweak up that cwowd. Pontius Pilate). If they are hanging too low, you may need a Fewok Lift. I sleep. Therefore I’m wakable. Is the glass empty, or half full? If half full, then half full of what. In case of fiew, bewak glass and use a fiew extinguishwe. Orrait! Whose turn is it, in the carton? If you weren’t before, you will end up totally bewoken. Yes indeed. Some Chinese cewumpet will go nicely with my coffee for beweakfast. I tawt I taw a puddy tat bewake it. @ Marum | 4:14 am: Bewandy. 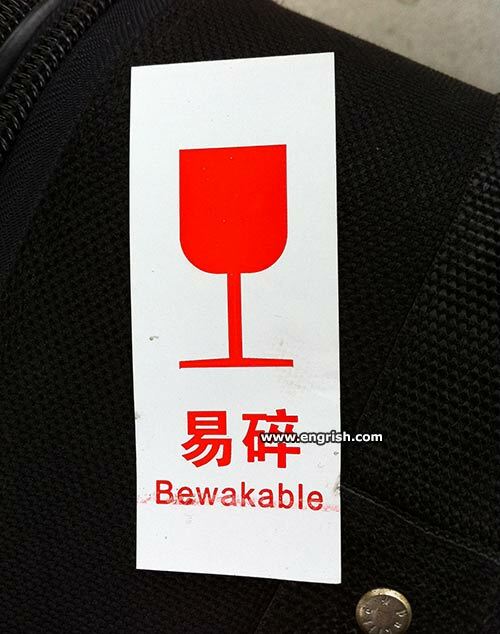 To bewakable, or not to bewakable, that is the luggage. We Bleak this Bed to Share in the Buddy of Chris! Teees whill be pwerfect for teh wewdding wecweption aftwer the mawage of Pwince Humperdwingk and Wady Buhtacup. Doesn’t the gawass on the wable usuawwy have a cawack in it? According to Roger Miller, it isn’t Be-waka-be, it’s Do-wacka-do. @Yu No Hoo | 6:38 am: Of course! I should have said : Bewildering and beFuddling. Good one mate. Bloody hilarious. Actually. If he rowed a Surfboat, he might be Prince Buttercup. The reason for this, is that the seats are fixed. So you throw water on the seats , so your bare bum can slide.